A few bold lines, drawn simply and cleanly. A bright and cheerful color palette. Dynamic scenes from fables that embolden the viewer to live out his or her own creativity. 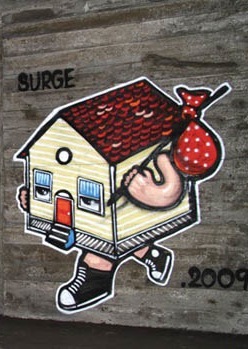 These are only some of the facets of the work of Sergio Hernandez, also known as Surge. 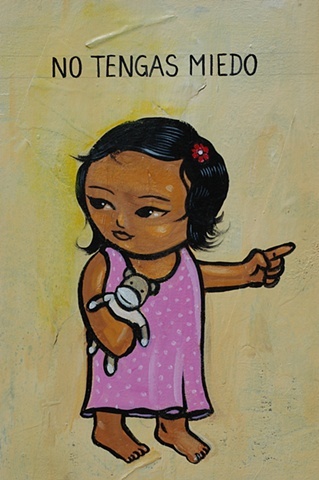 Starting in graffiti-writing as a teenager, Hernandez has since expanded his expressions to other media. "I can't really pick one medium," he says. "I love to make rap songs. In fact, my latest record is due out early next year. Tattooing is the best job ever. 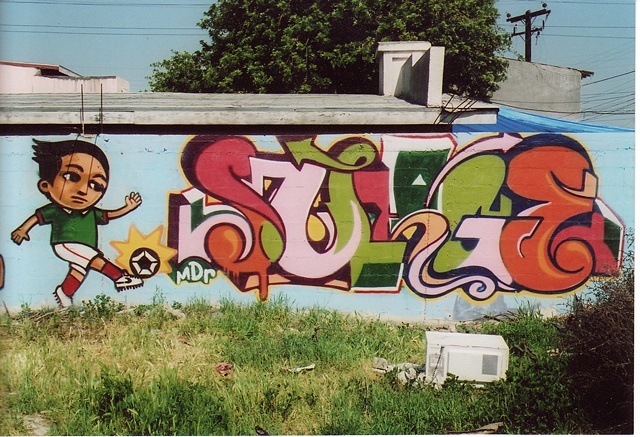 Graffiti is fun as hell. Jiu-jitsu too. I'm still getting better at all of them, so that keeps my interest going. Just to see what happens next." 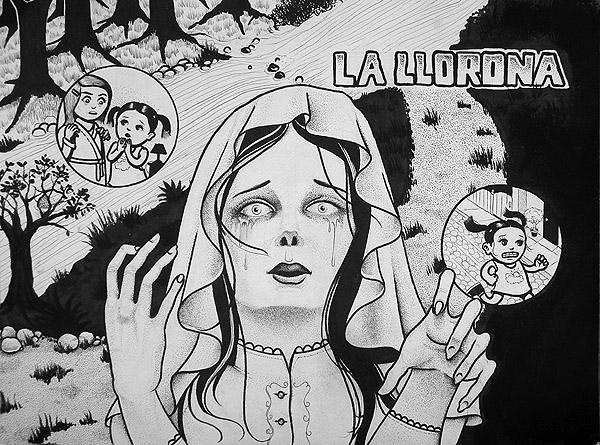 One of Hernandez's most successfully-rendered themes is the effect of fear on the innocent. 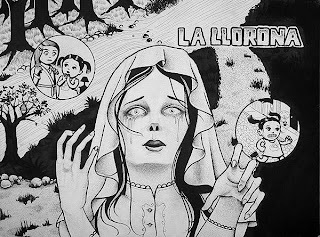 "I was told the ghost story of 'la llorona' [about a ghost who wails at night while searching for her murdered children] when I was a little youngster, by my cousins in Tijuana," Hernandez says. "And it scared the crap out of me. My drawing of it takes place in the heads of the kids who hear the story. Through a larger view, I see it as being about fears that are instilled in us at an early age. Everyone seems to want to scare the kids. Church tells you to be afraid of God. Schools tell you to be afraid of authority. Television tells you to be afraid of everyone. And then your parents usually vouch for all of this garbage. Some people grow up with a complex. I've seen it, and it's pretty messed up." Hernandez sees his roles as husband and father as an essential influence on his art, "My wife is an influence on me, of course. She's my best friend and business partner. And I don't separate my role as a parent from whatever my role as an artist is supposed to be. As my three kids grow, so does the imagery in my work. Since they were born I've wanted to do pieces that they like or that they can somehow relate to. As they get older, then maybe so will the topics covered in my paintings." Another of Hernandez's themes is the transformation of the weak into a heroic source of informed strength. 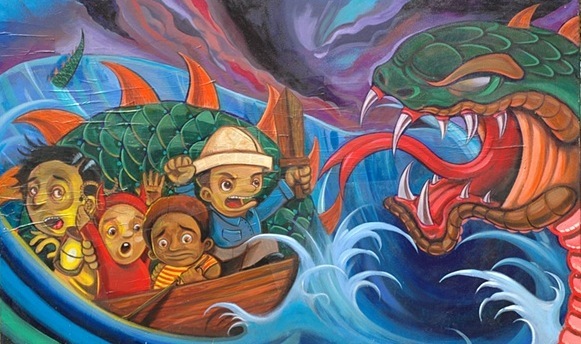 His painting, Sea Serpent, depicts a boat full of children attacked by a storm as well as a giant angry snake. About its texture and meaning, Hernandez says: "I used newspaper to give the canvas some texture. I've always liked for it to seem as if there was other information underneath the painting that you are looking at. The painting is about my love for Frank Frazzeta's work. A lot of times his paintings have big monsters that humans have to fight. The painting is also about the power of a child's imagination. At that time, I had seen the movie Waking Life by Richard Linklater. It's about the difference between a person's waking life and their sleeping, or dreaming life. So I imagined that the characters in Sea Serpent all had the same dream that night. They're not in real danger, though it feels like that to them." A special point of interest in Sea Serpent is the boldness of the child in the center of the canvas. Instead of giving in to the flight and panic instincts of his companions, the boy is confronting the challenges that face him and his friends. Moving forward despite obstacles and set-backs - is another of Hernandez's powerful themes. When his friend Carlos Beltran was forced to move his Voz Alta art gallery, Hernandez came up with an image of a vagabond house. 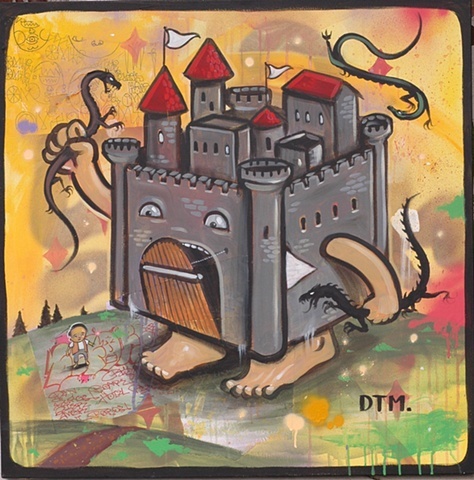 "I painted a house with legs to represent the concept that his gallery does not belong to a specific location. It has become an extension of his life no matter where the physical location is." Hernandez's clarity and strength comes in part from his practice of jiu-jitsu, the martial art which teaches the mastery of one's own body and mind. "Jiu-jitsu has taught me to be more patient and has just overall made me a better person. My style is developed from what my friend and renowned practioner Master Baret Yoshida has taught me. Jiu-jitsu is the most effective martial art in the world because it is not dependent on brute force. It can be really fluid, and each individual's personality really shines. Sometimes it kind of looks like break-dancing, only, it's better because it can teach you how to choke someone lifeless or to break a person's arm if you have to defend yourself in the streets. But I'm not interested in hurting people, except when I fight in competition." The theme of mastering or learning to master one's body and mind spills over into many of Hernandez's pieces. 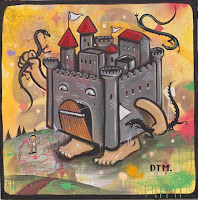 In his piece called Done Trying Magic, a boy's first experiment with magic mistakenly brings a wicked castle to life. And in his robot-suit series, a child maneuvers a robot suit from within, through various adventures and mis-adventures. The moral of these original visual stories seems to be that power alone does not create positive change, but that with practice, respect and a devotion to family, "everyone has the power of the universe at their disposal." Clearly, Surge speaks from experience.